Fair Play – James “Carey” Wood, 65, husband of Deborah Willis Wood, of Fair Play, passed away Friday, April 12, 2019 at St. Mary’s Sacred Heart Hospital. A native of Oconee County, he was the son of the late JC Wood and Joyce Neese Wood. Carey was a logger and was retired from Fair Play Equipment where he was a welder. 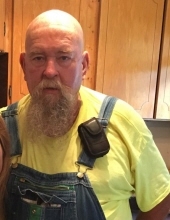 Mr. Wood served as a volunteer fireman with the Fair Play Fire Department for over 25 years, he enjoyed riding motorcycles, raising chickens and was a member of East Lavonia Church of God. Survivors include sons, James Wood (Becky) of Anderson, Jeremy Wood (Ann Marie) of Fair Play; daughter, Michelle Norris (JR) of Westminster; brother, Dean Wood of Fair Play; sisters Libby Whitten of Fair Play and Debra Allen of Anderson; and nine grandchildren. In addition to his parents, he is preceded in death by a brother, Richard Wood; sister, Edith Gail Williams and grandson, Wiley Wood. A funeral service will be held 2 pm, Monday, April 15, 2019 at Fair Play Church of God. Burial to follow in Fair Play Church of God Cemetery. The family will receive friends 6-8 pm, Sunday, April 14, 2019 at the Sandifer Funeral Home. To send flowers or a remembrance gift to the family of James Carey Wood, please visit our Tribute Store. "Email Address" would like to share the life celebration of James Carey Wood. Click on the "link" to go to share a favorite memory or leave a condolence message for the family.